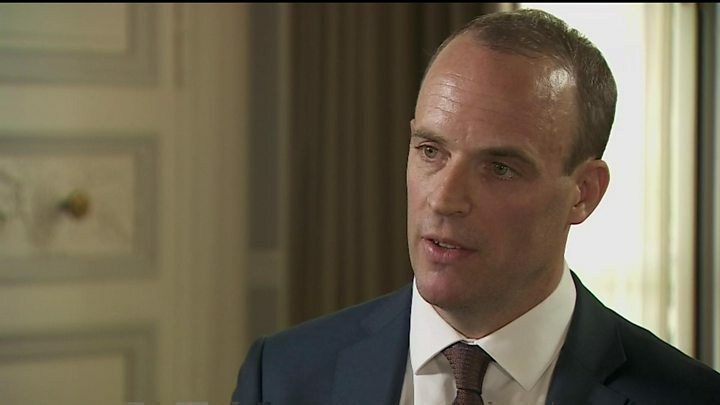 The UK will "move swiftly" to safeguard the future of EU citizens in the event of no deal being agreed, Brexit Secretary Dominic Raab has said.After talks in Brussels, he told the BBC the UK had a "moral obligation" to people and it was "inconceivable" they would be "turfed out". The EU, he said, must match the UK's "ambition and pragmatism" if the gaps between them were to be overcome.Counterpart Michel Barnier warned of a "blame game" over a no deal outcome. Mr Barnier said fundamental disagreements remained on future economic issues and the EU would not abandon its principles when it came to the integrity of the single market. The two sides have agreed that talks will continue without interruption to try to secure a deal in advance of the UK's departure on 29 March 2019. In recent weeks there has been an increasing focus on the possibility of no deal being reached, and on Thursday the government is to publish a series of technical notices aimed at preparing for this scenario.Mr Raab dismissed what he said were "hair-raising scare stories", promising Thursday's documents would provide clarity.Asked whether the UK would guarantee the future of EU workers if there was no deal, Mr Raab said in the "unlikely eventuality" that this happened, the UK would "move swiftly to secure their position". "We hugely value the contribution of EU citizens here in the UK and I am confident that in the unlikely eventuality that we don't have a deal, we will move swiftly to secure their position," he said. "It is inconceivable we would do anything other than make sure that they are legally in a position where they're secure to stay," he said, adding that "we are talking about real people...and we have got a moral obligation".He added: "There's no question that we're going to see EU citizens turfed out. We've made that clear in the past. I've made that clear in the past, I'm happy to give that reassurance today. "Mr Raab told the BBC that the two sides needed to "step up the ante" and he would be returning to Brussels next week to ensure momentum was not lost.He said a "workable solution" was needed to address the concerns of communities on both sides of the Irish border.At a press conference earlier, the EU's negotiator said his goal was to strike a future partnership of "unprecedented" scope with the UK.But he warned progress on trade and economic co-operation lagged behind that on security and defence issues and said the EU would not compromise the integrity of the single market. Mr Barnier said the question of the Irish border must be "de-dramatised" with the onus on both sides to make clear "which controls are needed where and how this should be done".He added: "Our challenge for the coming weeks is to try and define an ambitious partnership between the UK and the EU - a partnership that has no precedent. "This partnership has to respect the single market and the foundations of the European project, and if this is well understood we can conclude the negotiations successfully."